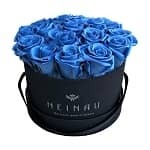 Our roses that last a year or longer are 100% natural fresh-cut and treated with a natural proprietary and patented moisturizer that will leave the roses just as subtle and beautiful as they were before harvest. 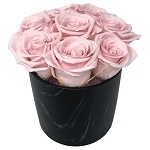 Start out by first choosing a vase style, before selecting your favorite rose color from the drop-down menu. 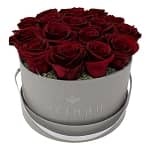 Natural Roses that last a Year or Longer - Our Allure arrangement has been so popular that we created a second color, Ebony. Very elegant! 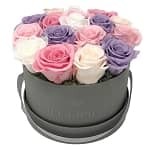 It Also has 36 long lasting roses but set in a low black ceramic container. Stunning centerpiece. This piece is an eye catcher. 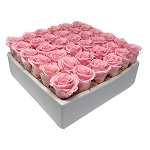 10x10x4"
Natural Roses that last a Year or Longer - Our popular Allure in white. Very elegant! 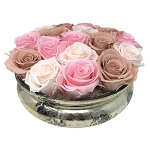 It has 36 long lasting roses set in a low white ceramic container. Stunning centerpiece. This piece is an eye catcher. 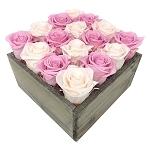 10x10x4"
Natural Roses that last a Year or Longer - Our handmade white wooden box is filled with 25 beautiful long lasting roses. The box can also be hung as an Art piece on a wall. 8.5x3x8.5" Impressive home decor piece. 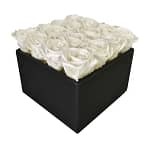 Natural Roses that last a Year or Longer - Our popular 16 series in white. 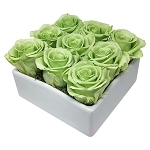 16 beautiful long lasting roses, color of your choice, set in a simply elegant white ceramic container. 6x5.5H". 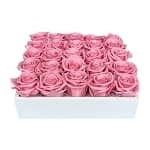 Natural Roses that last a Year or Longer - Approx. 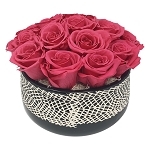 16 gorgeous long lasting Roses set in a contemporary simple black ceramic square. 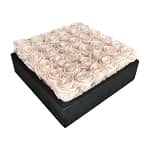 Great decor piece or an elegant gift. 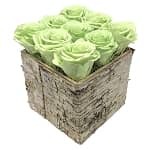 6x6x7.5"
Natural Roses that last a Year or Longer - Birch bark cube filled with 9 gorgeous Roses and an accent of preserved reindeer moss. An earthy and contemporary arrangement. 5Lx5W x 6'H. 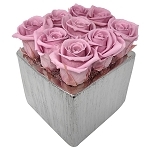 Natural Roses that last a Year or Longer - Modern marble look cube filled with 4 beautiful long lasting roses. 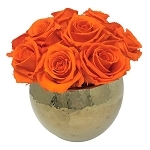 The perfect gift and accent piece to add a splash of color of your choice. 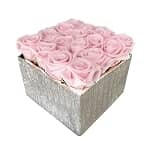 3x4.5"
Natural Roses that last a Year or Longer - 4 beautiful roses set in a 3" crackled silver ceramic cube. 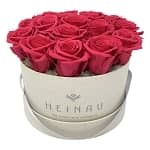 Perfect small gift that will add a nice accent anywhere. 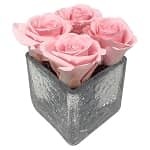 3x4.5h"
Natural Roses that last a Year or Longer - Modern black marble look cube filled with 4 beautiful long lasting roses. 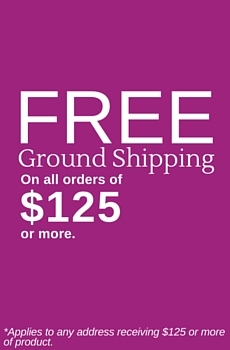 The perfect gift and accent piece to add a splash of color of your choice. 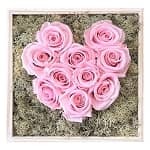 3x4.5"
Real Rose in Glass that lasts a Year or Longer - Stunning - One gorgeous long lasting Rose set in a 4" round glass vase. 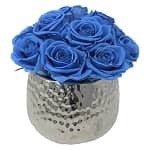 The perfect gift to make a long lasting impression or as an accent piece. 3.5x4". 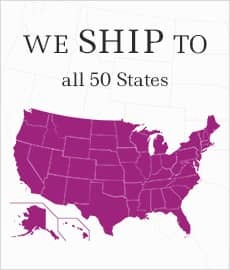 Comes in a pretty gift box with a care card. 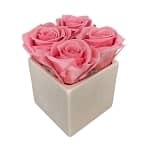 Natural Rose that lasts a Year or Longer - A simple stand out that delivers your message every day - and fits anywhere from the most crowded desktop to the smallest studio kitchen. 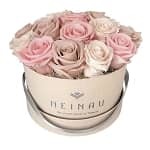 A single carefully-selected rose bloom of your choice of colors, set into a classic glass cube. 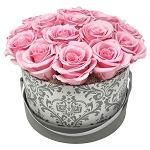 Comes in elegant silver gift box. 2.5x2.5".